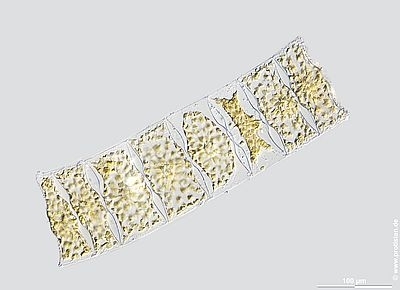 caption Sample from North Sea near Heligoland (spring diatom bloom). Scale bar indicates 100 µm. The image was built up using several photomicrographic frames with manual stacking technique. Images were taken using Zeiss Axioplan with MFT camera Olympus OM-D E-M5 II.